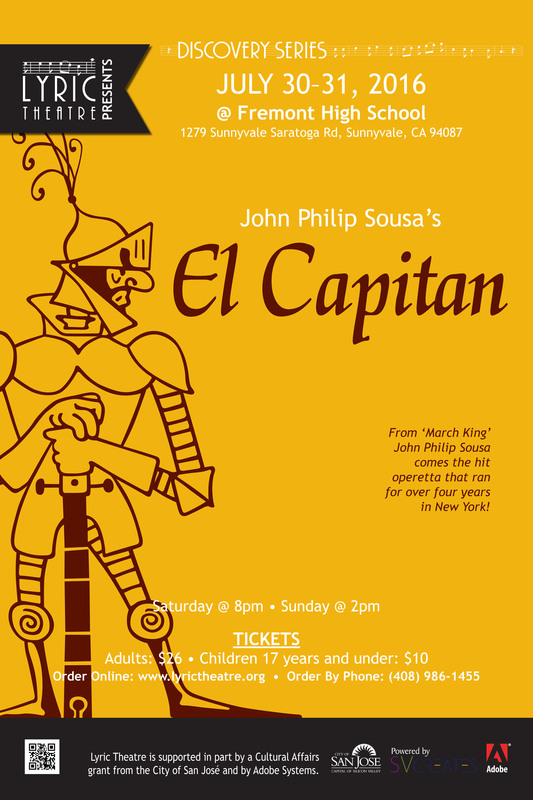 El Capitan is an operetta in three acts by John Philip Sousa and has a libretto by Charles Klein (with lyrics by Charles Klein and Tom Frost). The piece was Sousa's first successful operetta and his most successful stage work. The march "El Capitan" became a standard work both for brass bands and a crossover into other genres. Don Enrico Medigua is the viceroy of Spanish-occupied 16th-century Peru and fears assassination by rebels. After he secretly has the rebel leader El Capitan killed, he disguises himself as El Capitan. Estrelda, the daughter of the former viceroy, Cazzaro, impressed by tales of El Capitan's daring, falls in love with the disguised Medigua, who is already married. Meanwhile, Medigua's wife Marganza and daughter Isabel (who is being wooed by the handsome Verrada) search for him, and the rebels capture the Lord Chamberlain, mistaking him for the viceroy. Medigua leads the hapless rebels against the Spaniards, taking them in circles until they are too tired to fight. The Spaniards win, the mistaken identities are revealed, the love stories are untangled, and the story ends happily. Ticket sales are final - no refunds. • For exchanges or questions call (408) 986-1455.